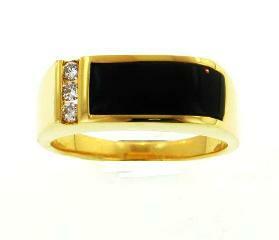 A 18K yellow-gold ring set with Black Coral gemstone and faceted round Diamonds totaling to 0.16 carats. Ring Sizing Policy: Please allow an additional 4 to 7 days for sizes other than women's size 7 and men's size 9. Please note, sized merchandise can only be returned for store credit. Copyright © 2009 eblackcoral.com, All right reserved.